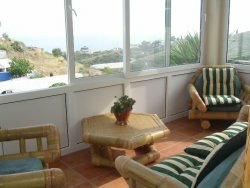 The villa consists of 3 bedrooms, 1 large bathroom, the 4th bedroom en-suite is in a separate guest house just outside the villa. Entrance to enclosed terrace with views over the Med. that opens up with large sliding windows, Steps leading down to a large pool, 8x4, terrace with sun loungers. 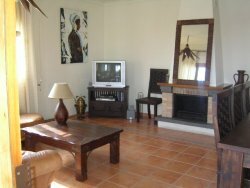 Large lounge with satellite TV, DVD and CD Player, open fire place etc. Separate fully equipped kitchen, ie. Dishwasher, washing machine, tumble dryer, oven, cooker, microwave etc. All bedrooms are air conditioned! 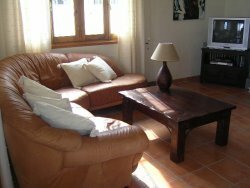 - The villa is situated approx. 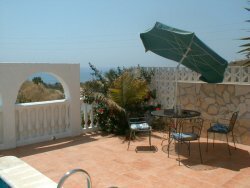 25 minutes from Malaga airport. - A convenience store a couple of minutes walk. Thursday Market at Torre del Mar etc. etc. A wide variety of sports await those seeking an active holiday. Golf, Sailing, jet skiing, fishing, Aqua Park, and Go Karting are all available nearby, together with riding and trekking in the hills. Balance to be paid - 4 weeks prior to arr to arrival.